It's fascinating to realize that the largest Japanese population outside of their country is located in Brazil. Japanese immigration to Brazil began in 1908 with the arrival of about 800 Japanese, many farmers, and a number of them obtained jobs working on coffee plantations. After World War I, there was a boom in Japanese immigration to Brazil, most settling in São Paulo, and presently, there are roughly 1.5 million Japanese in Brazil. From the start, Japanese ingredients, foods and Sake were imported into the country and there is some evidence there were also Japanese brewers in Brazil who were producing Sake, miso, and soy sauce. The first Sake brewery of note was Tozan Farm, which started producing Sake in 1934. Because of the hotter temperatures in Brazil, it wasn't easy to make Sake but the brewery succeeded and still exists. Currently, there is at least one other Sake brewery in Brazil too. 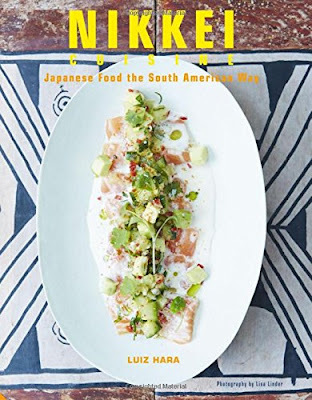 The Japanese in Brazil needed to adapt their cuisine, to handle the different Brazilian ingredients that were more readily available and less expensive than imported ingredients, creating a "Nikkei cuisine." For about one hundred years, this cuisine has evolved, merging the best of the two cultures, yet many people are probably unaware of it. There certainly are no restaurants in the Boston area which specialize in this cuisine. However, home cooks now have a resource so they can prepare and experience this cuisine for their family and friends. Nikkei Cuisine: Japanese Food the South American Way by Luiz Hara ($35, Jacqui Small LLP, October 2015). is a hardcover book of 256 pages (which is also available as an e-book). Luiz Hara, an Italian-Japanese Brazilian chef, was raised in the Brazilian city of São Paulo and has lived in London for over 20 years ago. He underwent culinary training in Japan, earned a degree at Le Cordon Bleu in London, and started The London Foodie blog in 2009. The book begins with a brief introductory chapter, "What is Nikkei Cuisine?" The term Nikkei derives from the Japanese word nikkejin and basically refers to those Japanese who migrated overseas and all of their descendants. As such, Nikkei cuisine is "the cooking of the Japanese diaspora." It will vary dependent on where the Japanese settled as they adjust and modify their cuisine, using different local ingredients and cooking styles. This chapter also provides some family background on the author as well as a brief history of the Japanese immigration to Brazil. The eighth chapter is Mastering the Basics: Sauces, Marinades & Condiments: which touches on the basic recipes of Japanese cuisine, from making rice to tempura, dashi broth to teriyaki sauce, ponzu sauce to sesame dressing. This section would be helpful for many cooks who want to use some of those basics in their own recipes. There is then a brief section with a glossary of ingredients from Japanese, Brazilian and Peruvian cuisines. The recipes run the range from easy to complex, so the cooks of all skill levels will find recipes they can use. Each recipe is accompanied by a beautiful color photo, making this a visually compelling cookbook as well. If you enjoy Japanese cuisine, this intriguing variation will appeal to you. The same applies to those who enjoy Brazilian and Peruvian cuisine. This isn't a fusion cuisine that someone recently tried to combine. This is a cuisine which was slowly integrated over decades, a necessary blending by immigrants in a new country. Thus, the concepts have been tested and honed over time. Nikkei Cuisine:presents a more unique cookbook, one which highlights a cuisine which previously has not received sufficient attention. With the holidays coming, this would be a nice gift or you can buy it for yourself to create some of the recipes for your holiday dinners. I am most intrigued to try the Spicy Miso Bolognese, and will report back once it is made. I also recommend that you pair these recipes with Sake, which should be an excellent accompaniment to all of these dishes.